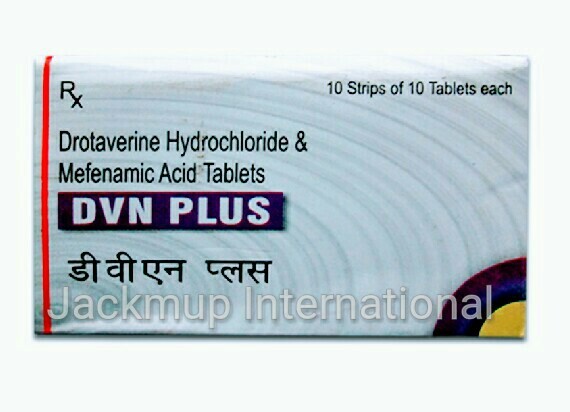 Description:- Drotaverine is used in abdominal pain and menstrual pain.It is an antispasmodic. It increases the levels of chemical messengers that relieves the pain due to smooth muscle spasm or tightness. Mefenamic Acid is used in fever, arthralgia, myalgia, osteoarthritis, rheumatoid arthritis, post operative pain and pain during menstruation.It is a non-steroidal anti-inflammatory drug (NSAID). It works by blocking the release of certain chemical messengers that cause fever, pain and inflammation (redness and swelling). Take drotaverine tablets 20 minutes before a meal to relieve or reduce post meal symptoms. Consult your doctor before you start drotaverine if you are pregnant or plan to become pregnant. Stop taking drotaverine and consult a doctor, if experience severe allergic reactions. Due to possible side effects such as dizziness and vertigo resulting from hypotension, you should avoid driving or using machines. Side Effects:- Nausea, Vomiting, Headache, Fainting, Dry mouth, Constipation.